Human Settlements and Energy deals with the impact of energy considerations on human settlements planning and development. The book addresses the energy use, consumed mostly by human settlements, and the ways to conserve energy in these habitats. The text reviews the demand for energy, the principal uses of energy, and as the Economic Commission for Europe sees it, the need for human settlements to disconnect from heavy dependence on fast disappearing hydrocarbon fuels. The text examines two options as solution: nuclear-generated electricity (which many regard as undesirable) or reduce the growth of energy use. The book also examines the statement made by the Ottawa Seminar that "reducing energy consumption is a more difficult problem than increasing energy production." 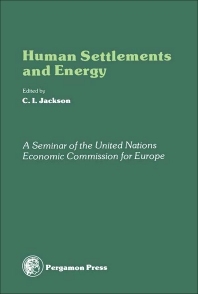 The book explains that policies on energy reduction should be a considered a global co-operative effort, moral obligation, as well as policies reflecting lifestyle changes, capital allocation, energy consciousness in physical planning (building design, automotive efficiency), and improved energy conversion. This book is helpful for environmentalists, conservationists, policy makers in the field of energy generation, conservation, or conversion, nuclear physicists, geothermal engineers, and scientists in the field of energy development research. Component Standards or Performance Standards?